The Rockin' Tug is a flat ride. It is average speed, rerideable, fun, it has a large capacity, and a long duration. Only fun if in the very back. Nice family ride. Looks a little bit like Gilligans Island, too. Cool ride. Interesting ride. Though not all that thrilling, it is a great attraction for families, as anyone can ride this. Remember the theme from "Gilligans Island"... "And the tiny ship was tossed"... and the footage of the Minnow bouncing around on the waves with Gilligan and the Skipper being thrown around the deck? That pretty much describes the action of this ride. It is basically shaped like a tug boat with a seating configuration very similar to the Galleon. While it rocks back and forth on its "cradle" shaped track, it also rotates from the center point. In the "bow" and "stern" you get the most movement, while in the center I assume you are practically turning in circles while the boat rocks back and forth. Not an extremely fast and thrilling ride, those with equilibrium problems may wish to avoid this because it can make you dizzy. 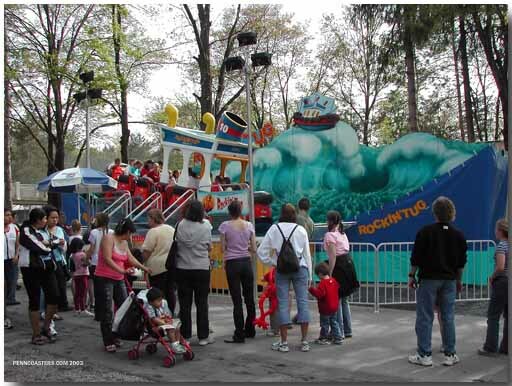 Kids will love this because for them it could be considered a "big ride" (a non kiddie ride) and adults will find it fun. My wife and I couldnt stop laughing.